Jon Huntsman Jr., a former Utah governor and ambassador to China, isn’t a serious contender for the Republican presidential nomination. And that’s too bad, because Mr. Huntsman has been willing to say the unsayable about the G.O.P. — namely, that it is becoming the “anti-science party.” This is an enormously important development. And it should terrify us. Mr. Perry, the governor of Texas, recently made headlines by dismissing evolution as “just a theory,” one that has “got some gaps in it” — an observation that will come as news to the vast majority of biologists. 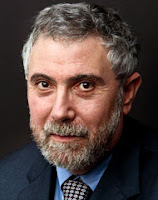 Mr. Krugman’s concern is that a politician stated that evolution is just a theory and that it has some gaps in it. In fact, evolution does not explain how mammals arose. Nor does it explain how reptiles, birds, amphibians or fish evolved. It doesn’t explain how species evolved abruptly in many cases. It doesn’t explain how the DNA code evolved or life itself first arose. In fact, evolution cannot even explain how a single protein could have arisen. There are 27 orders of magnitude between evolution’s expectations and reality. And that is going by the evolutionist’s own reckoning (in reality it is 100+ orders of magnitude). Indeed, practically all of evolution’s major predictions have turned out false. Need we say more? Yes, evolution has gaps. Even evolutionists admit it has gaps. But Mr. Krugman believes otherwise. He thinks evolution’s many gaps would “come as news to the vast majority of biologists.” And he is alarmed that this is a sign of increasing anti-intellectualism. I am not a scientist. But beginning in about 1990 I started organizing an annual debate at Oxford University on science versus religion where the focus was almost always on evolution and which featured some of the world's greatest evolutionists like Richard Dawkins, who appeared several times, and the late John Maynard-Smith of the University of Sussex, who, at the time, was regarded by many as the greatest living evolutionary theorist. While I moderated the first few debates, I later participated in a debate against Richard Dawkins at Oxford which he later denied ever took place, forcing us to post the full video of the debate online where Dawkins is not only the principal proponent of the science side but actually loses the debate in a student vote at the end. I later debated Dawkins again at the Idea City Convention at the University of Toronto, the video of which is likewise available online. What I learned from these debates, as well as reading extensively on evolution, is that evolutionists have a tough time defending the theory when challenged in open dialogue. Indeed, David Berlinski, the author of The Devil's Delusion, was, although an agnostic, on the religion side of one of the debates against Dawkins and tore large holes in evolution that Dawkins and Maynard-Smith struggled to address. This does not mean that evolution is not true or that theory is without merit or evidence. It does, however, corroborate what Governor Perry said. Evolution is a theory. It is unfortunate that hack journalism is alive and well, and misrepresenting science. “That's a theory that is out there -- and it's got some gaps in it. In Texas, we teach both creationism and evolution. I figure you're smart enough to figure out which one is right." "That's a religion and it's out there, but it has some flaws in it. In Texas we teach both Christianity and atheism. I figure you're smart enough..."
The usual misleading nonsense we've come to expect from Cornelius Hunter. When Perry spoke of gaps in the theory, he was obviously not referring to gaps in the theoretical framework of evolutionary mechanisms (how would Perry know anything about that? He is a willfully ignorant parasite), but referring to "gaps" in the "theory" that evolution has occurred at all. Hence his lie that creationism is taught alongside evolution. Any reasonable reading of Krugman's words clearly implies that biologists would be surprised to learn about the latter kind of gap. As Cornelius knows of course. I admit it's great fun watching the Republican nominees pander to the base. Last time around, McCain was the only one not to deny evolution, but even he had to express respect for belief in a young earth. This time, Huntsman and probably Romney, are the sane ones. Curiously, both are Mormons. With your anti-science blithering on this blog being exhibit #1A. Perhaps that explains why Richard Dawkins chickened out in the open invitation to debate William Craig at Oxford on October 25th. As this blog shows, evolutionist arguments usually descend into name calling and empty rhetoric. No wonder Dawkins lost to the student vote at Oxford. Having chickened out of a serious debate he is busy going after someone his own size --- writing a children's book. Typical evolutionary weasel behavior. Evolutionists typically lose the serious open debates not because they are dumb or stupid people or intellectually inferior ... they lose because they are on the wrong side of the evidence. Pedant said, "Imagine, if he had been asked about Christianity, and he had said:"
A subtle admission that evolution is equated with religion, so criticism is not allowed? The politically correct hogwash that thinks certain topics should be above questioning. If Perry did believe that Christianity has "flaws" that is his right to express it and have open debate on it. Let the chips fall where they may. Only those that aren't confident in supporting their belief's have to try to censor debate and start name calling the intelligence of the other side. Neal: ...they lose because they are on the wrong side of the evidence. Don"t you mean, "wrong side of the cosmic battle of good and evil raging in this age?" Serious debate? With Craig? You've got to be kidding. The guy spends his days thinking of how it is possible to be a loving and compassionate being prior to the beginning of time. And he gets paid to do that! CH: It is practically impossible to stay abreast of the many misconceptions and misrepresentations of evolution in the popular media. Agreed. It's hard enough to keep up with the "many misconceptions and misrepresentations of evolution" you present on just this blog, let alone the popular media. Does the name Ann Coulter ring any bells? "In Texas, we teach both creationism and evolution." When a politician criticizes religion, Jesus will write in the sky, "Look at me!" Anyone else sense another attempt to flush an embarrassing post from the front page? The difficulty this time is figuring out which is the offending post, as there are so many embarrassing ones to choose from this time. oleg said, "Serious debate? With Craig? You've got to be kidding. The guy spends his days thinking of how it is possible to be a loving and compassionate being prior to the beginning of time. And he gets paid to do that!" Funny how someone like that can send Dawkins and other evolutionists running for the hills. They have a big roar in front of school students putting up their eye-box object lessons to teach the fairy tale of eye evolution and such, but a boatload of excuses when it comes to mano a mano. Perhaps it would be fitting to put a rubber chicken in the debating chair at Oxford to represent the missing evolutionist. Troy: " Any reasonable reading of Krugman's words clearly implies that biologists would be surprised to learn about the latter kind of gap. As Cornelius knows of course. " Nonsense we come to expect. If Troy thinks there are no gaps, why can't the guys who can't see any gaps write a book and describe to us in detail how any biological structure evolved, as IN DETAIL, STEP BY STEP, with each micro step documented Any structure! Any! How about a claw? Or something as simple. If it takes a whole shelf of volumes to do it you guys would have done it by now and spent whatever it took to do it because anything would be better for you guys than being the minority viewpoint in this country. Better than having to come back to these blogs every day and spewing your frustration and personal disdain. The lack of such detailed study(ies) is a GAP in your creation story, I'm sorry to break it to you, and reflects on the speculative basis for "evolutionary biology" as many people are discovering. Lack of civility on your side is also a monstrous gap in the personalities involved. I've never seen any kind of detailed, step-by-step explanation of how a planet, or moon, or tiny space rock was formed. There is certainly lots of speculation and guess work and a whole lot of "just so" stories about how they "might" have come about, but nothing concrete, and certainly nothing verified with the level of detail that you are demanding. Am I correct in assuming that you believe that cosmology should be presented with a similar level of scorn for its "speculative" nature? Just Google middle ear evolution if you want to see a fairly detailed step-by-step example of the evolution of a biological structure. If you want to know every mutation in every genome of every individual that contributed to the current mammalian gene pool over the last 200 million years, well, that's not going to happen. What exactly would satisfy your curiosity? Nonsense we come to expect. If Troy thinks there are no gaps, why can't the guys who can't see any gaps write a book and describe to us in detail how any biological structure evolved, as IN DETAIL, STEP BY STEP, with each micro step documented Any structure! Any! How about a claw? Or something as simple. If it takes a whole shelf of volumes to do it you guys would have done it by now and spent whatever it took to do it because anything would be better for you guys than being the minority viewpoint in this country. Better than having to come back to these blogs every day and spewing your frustration and personal disdain. The lack of such detailed study(ies) is a GAP in your creation story, I'm sorry to break it to you, and reflects on the speculative basis for "evolutionary biology" as many people are discovering. Evolutionary biology doesn't know every last mutation, every last detail that happened in the last 500 million years but we know a helluva lot more than you Intelligent Design Creationist clowns do. Go ahead MSEE give us some details, ANY details about how IDC was done. Describe the steps, ANY steps. Tell us when the design/creation was done, and where, and the mechanisms used, and how the raw materials were gathered, and who the designer(s) were. It's easy for you clowns to run your big mouths and demand impossible levels of detail from science, but ask you to provide anything even close to the same level and you peel out so fast you leave skid marks. Venture Free: "I've never seen any kind of detailed, step-by-step explanation of how a planet, or moon, or tiny space rock was formed. There is certainly lots of speculation and guess work and a whole lot of "just so" stories about how they "might" have come about, but nothing concrete, and certainly nothing verified with the level of detail that you are demanding. Am I correct in assuming that you believe that cosmology should be presented with a similar level of scorn for its "speculative" nature?" Absolutely, but not necessary. Physicists don't appear to have political/cultural axes to grind. We don't see them going around talking about how planets evolved now, do we? Looks like they know better. They simply answer "well, we just don't know how planets and galaxies formed"; which, of course, is a perfectly acceptable answer. Now if we could just get our design denying friends to answer in that same honest fashion, we could all er, get along. "Abstract: The basic stages of the formation of the planets are considered. Decay of turbulence in the solar nebula allows the precipitation of dust particles to the solar nebula''s equatorial plane, their growth occurring by sticking at collisions and transformation into kilometer-sized bodies (planetesimals) partly by direct growth and partly via gravitational instability in a dense dust layer formed near the central plane of the nebula. Analytical study of the dynamical evolution of a rotating swarm of bodies with quasi-equilibrium values of velocity and mass distributions gave a reasonable description of the final stage of accumulation. This is a robust result in that the time scale of formation of the terrestrial planets is 10e8 yr. Numerical simulation of the earlier stage revealed an accelerated (runaway) growth of the largest bodies—planet embryos. More careful study of the intermediate stage is needed. The two-step formation of giant planets is considered: accumulation of icy-rock cores of about 10–15 Earth masses, similar to that in the terrestrial zone, and accretion of gas onto cores of Jupiter and Saturn require time scales not much longer than 10e7 yr (mostly for the growth of their cores). Problems connected with a slow time of growth of Uranus and Neptune are discussed. Small bodies of the Solar System are byproducts of the formation of the planets. The fall of large bodies onto the planets at the last stage of accumulation brought much of stochastics into the process (planetary obliquities, etc.). It led to a much higher initial temperature of the Earth''s mantle, early beginning of partial melting and differentiation, which determined its pre-geological evolution." Quite a bit of detail there. You probably missed it because it was published in a mainstream science journal, not a Chick tract. Since you know a lot about Intelligent Design Creationism, maybe you could provides some answers. Please give us some details, ANY details about how IDC was done. Describe the steps, ANY steps. Tell us when the design/creation was done, and where, and the mechanisms used, and how the raw materials were gathered, and who the designer(s) were. Now if we could just get our design fantasizing friends to give ANY answers in an honest fashion, we could all er, get along. You are mistaken if you think that Krugman is a reporter. He is not. He is a propagandist. He will use any idea, no matter its truthfulness to control the mind of his readers. His goal is not illumination, but the indoctrination into secularism. He does not care if he uses lies as long as his readers believe him. For him any means justifies his goal. Secularism is his idea state, and anything is permissible to prevent the spread of theism, and especially Christianity. And there are legends of reporters just like him. They are the only people that will be graduated from journalism school. "It's easy for you clowns to run your big mouths and demand impossible levels of detail from science, but ask you to provide anything even close to the same level and you peel out so fast you leave skid marks. " Evolution is asked for evidence because it's presenting itself as science. Christianity has never claimed to be science, so why would we need to provide all this evidence? According to the bible faith in Christ is a gift from God and not something you are argued into. Evolution is actually a religion pretending to be science, and that's why it's having so much trouble. Btw, planetary evolution is not really the same thing as biological evolution (no random DNA mutations creating planetary design features) regardless of how much of Steve's post above is correct. "Only those that aren't confident in supporting their belief's have to try to censor debate...."
Please tell that to the moderators at uncommon descent and all of the other ID/creation sites. At least Cornelius does allow uncensored debate here, or so it appears. You are mistaken if you think that Krugman is a reporter. He is not. That's right, he is an economist who won a Nobel Prize. He also writes opinion columns for the NYT. He does not care if he uses lies as long as his readers believe him. For him any means justifies his goal. Are you a mind reader, Peter? I guess not, so you were just making that up. That makes you the liar, Peter. Evolution is asked for evidence because it's presenting itself as science. Christianity has never claimed to be science, so why would we need to provide all this evidence? Then why do so many IDC clowns keep trying to have Creationism introduced as science in public school classrooms? If they kept their non-scientific religious beliefs in their church and out of science classes there would be no problem. Evolution is actually a religion pretending to be science, and that's why it's having so much trouble. Yeah yeah, we know. Just like geology is a religion, chemistry is a religion, biology is a religion, genetics is a religion, paleontology is a religion...Might as well just shut all our schools down now and go back to the dark ages where the Church dictated what was 'true' about the world. Isn't that what you guys really wants? Thorton said "Then why do so many IDC clowns keep trying to have Creationism introduced as science in public school classrooms? " I actually agree that creationism and ID should not be taught in science class, but nor do I think any other origins "science" (like evolution) should be taught there. There should be a sharp demarcation between the "hard" sciences were things can be proven over and over again (chemistry, physics, biology, some genetics) and the more historical sciences (forensics, some genetics (esp evolutionary genetics), paleontology) where there is a heavier emphasis on logic and presuppositions amid the facts.